The photo seen on this page is a mystery! This is one of several photos that came to the library in a donated box of yearbooks. The yearbooks range from 1950s Posters (Painted Post yearbooks) and North Stars (Northside High School) to several Skjod Yearbooks (Corning-Painted Post West High School) from the 1980s. 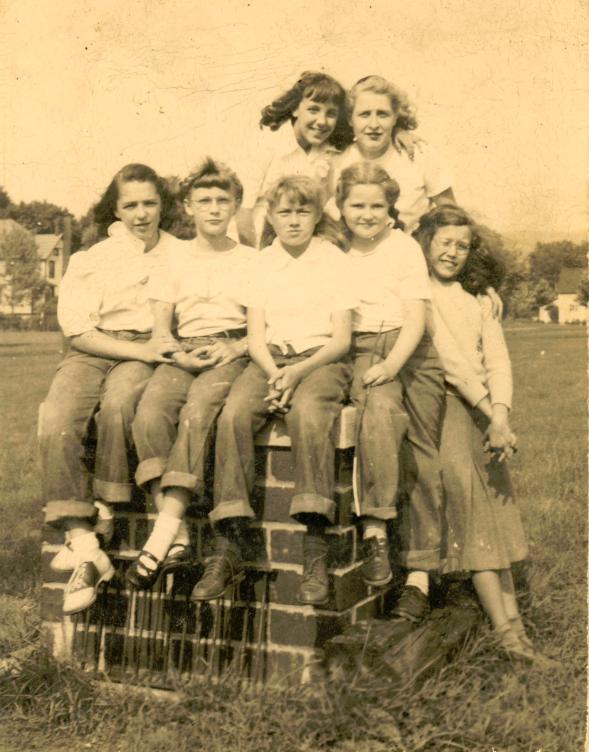 This photo, which shows a group of young kids in what I believe is a local setting, was one of several photos that fell out of a 1952 North Star yearbook. So the local history mystery is to answer three questions! 1. Who are the kids in the photo? 2. When was the photo taken? 3. Where was the photo taken? You can help us solve our current local history mystery! Just reply to this posting if you know anything about the photo! Local history is even more fun when it becomes a community effort! If you’ve got a photo that is mysterious to you, and you’d like to share it in hopes of finding out more about the people in the photo, the place the photo was taken and the circumstances surrounding the taking of the photo — let me know! We can feature it in one of our weekly Local History Mystery series! ← Welcome To The Corning History Site!